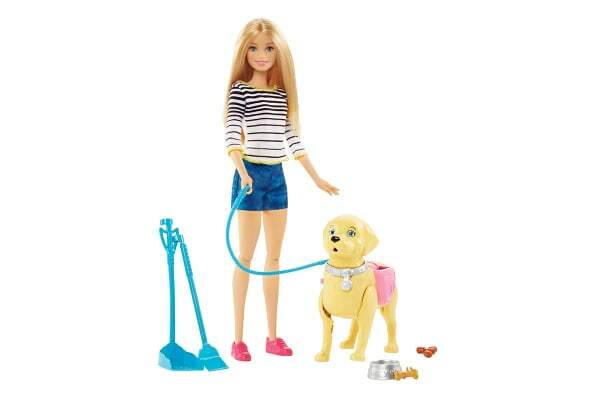 This special Puppy has walked its way into Barbie doll’s heart! Help Barbie doll keep up. 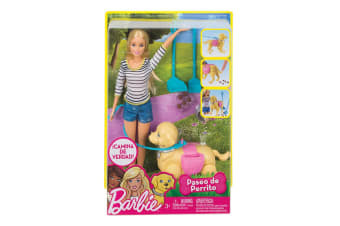 With the Barbie Walk & Potty Puppy, it’s so fun to help Barbie doll take her dog for a walk and potty train: simply wind the knob on the puppy’s side and pull back on the leash, the puppy starts walking all on her own! Barbie doll’s casually cool outfit pairing a striped top with denim shorts and pink shoes is perfect for a day at the dog park. Animal lovers will have so much fun taking this adorable puppy for a walk and playing out friendship and nurturing stories between two best friends.